Environmentalists and some policy experts are tying Pacific Gas & Electric’s bankruptcy to global warming. PG&E itself made that argument when lobbying California lawmakers to change wildfire liability laws last year. However, climate scientist Cliff Mass said global warming “had little to do” with the fires PG&E is liable for. Pacific Gas & Electric, California’s biggest utility, faces at least $30 billion in liabilities claims over massive wildfires, which activists and some policy experts say is a sign of the escalating risk of global warming to businesses. University of Washington climate scientist Cliff Mass, a frequent critic of attempts to link western wildfires to climate warming, doesn’t think so. 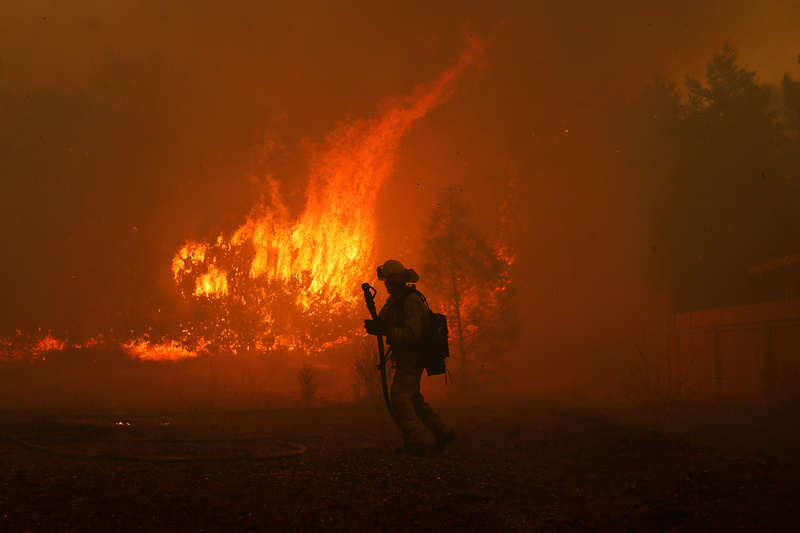 “Climate change had little to do with either the Camp Fire of this November or the Wine Country Fire of October 2017,” Mass told The Daily Caller News Foundation. PG&E is liable for damages its equipment caused in massive California wildfires over the past two years. However, a slew of media reports published in the wake of PG&E’s bankruptcy announcement Monday suggest global warming might be a factor in the company’s demise. 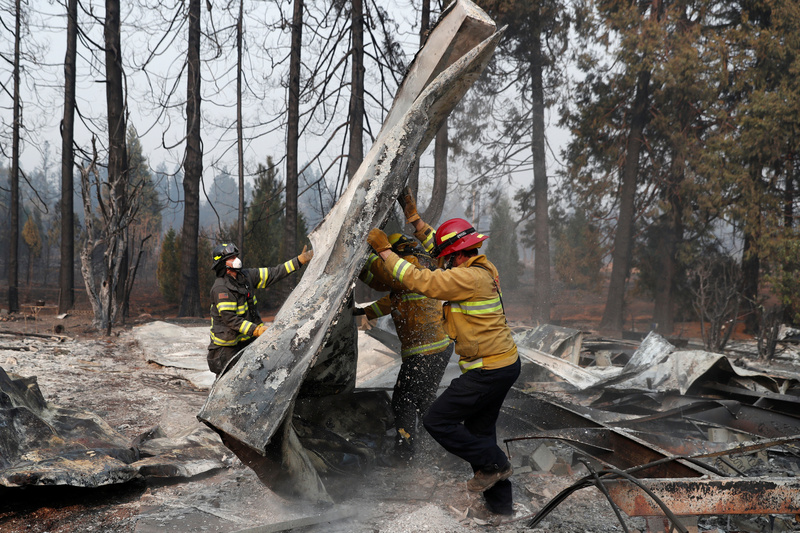 Firefighters move debris while recovering human remains from a trailer home destroyed by the Camp Fire in Paradise, California, U.S., November 17, 2018. REUTERS/Terray Sylvester. Wildfires “turned PG&E into a poster child for climate-change dangers,” Bloomberg reported, though it’s not clear PG&E will invoke the climate defense in its bankruptcy filing. Still, the company spent months promoting that argument. Former PG&E CEO Geisha Williams, who stepped down Sunday, said the company was facing “climate-driven extreme weather,” like devastating wildfires. PG&E used the argument to lobby California lawmakers to change state law, which currently holds utilities liable for wildfires sparked by their equipment even if they weren’t negligent. California’s legislature passed a bill last year that allowed PG&E to bill ratepayers for wildfire liabilities during 2017, which critics dubbed a “bailout.” However, that legislation did not allow the utility to bill its customers for any 2018 wildfires it’s found liable for. “This is climate change,” David Weiskopf, the climate policy director at NextGen America, told BuzzFeed News on Tuesday. NextGen was founded by billionaire Democratic donor and environmental activist Tom Steyer. “It’s what we’ve all been warning each other about for a long time. There will be impacts and they will be big,” Weiskopf said. A Cal Fire firefighter monitors a fire near a home while battling the Camp Fire in Paradise, California, U.S. November 8, 2018. REUTERS/Stephen Lam. State officials blamed PG&E power lines and equipment for more than a dozen wildfires that swept across Northern California in October 2017, and investigators are looking into whether or not the utility’s equipment sparked 2018’s deadly Camp Fire. The Camp Fire scorched more than 150,000 acres in November, destroying thousands of structures and leaving 86 people dead. The fire also decimated the town of Paradise, displacing roughly 27,000, fueled by powerful, dry Santa Ana, or Diablo, winds. “The fires were associated with a failing and poorly maintained power infrastructure, strong Diablo winds, and people living in appropriate locations on the wildland-urban interface,” Mass said. 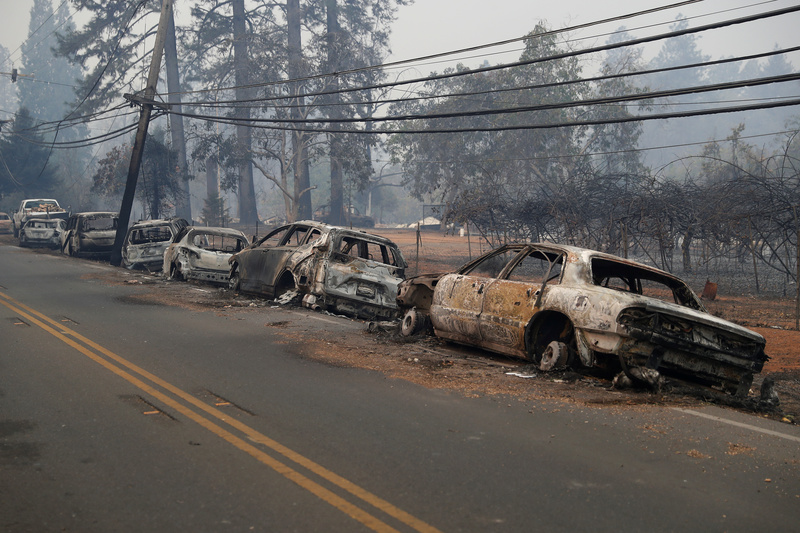 A row of burned vehicles are seen on Skyway during the Camp Fire in Paradise, California, U.S. November 9, 2018. REUTERS/Stephen Lam. Linking individual fires to global warming is a tricky proposition. Such studies, called “attribution” studies often rely on running climate models to generate theoretical scenarios of what might have happened without increased carbon dioxide in the atmosphere. Likewise, the 2017 National Climate Assessment found “low to medium confidence for a detectable human climate change contribution” for wildfires in the western U.S. based on existing studies.